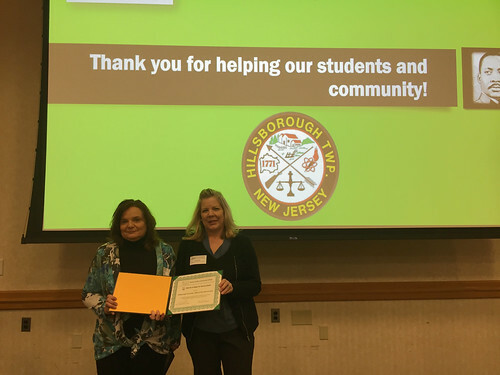 On Friday, January 25, Lee Santaromita and Siobhan Spano representing Hillsborough Township’s Health and Administration Departments, were among local community partners that were honored for their efforts to engage Raritan Valley Community College students in service learning and community engagement opportunities. The annual Martin Luther King Jr., Service Learning Community Breakfast was attended by more than 100 people at RVCC’s Branchburg campus. During the event, which was held to celebrate the legacy of Dr. Martin Luther King Jr., community partners, students, faculty and administrators gathered for a reflection and recognition of campus and community engagement activities.